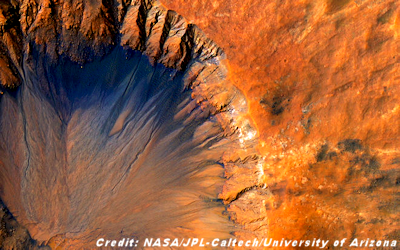 Dark streaks on the surface of Mars may indicate that liquid water flows there today. A new study has revealed more detail about the changes these briny trails are causing on the Martian surface. The dark, narrow streaks, called recurring slope lineae (RSL), appear and disappear seasonally. The new study shows that the streaks can leave behind veritable footprints — such as long-lasting changes in the color of the soil, or divots and bumps.